Australian football is considered a body contact sport. It follows the same format; played by two teams each with eighteen players and four interchange players. Similar to any other sport, there are certain rules that should be adhered to when playing Australian football with the purpose of explaining how the game should be played, prevent injuries to players participating in the match and ensure that the game is played in a fair manner. 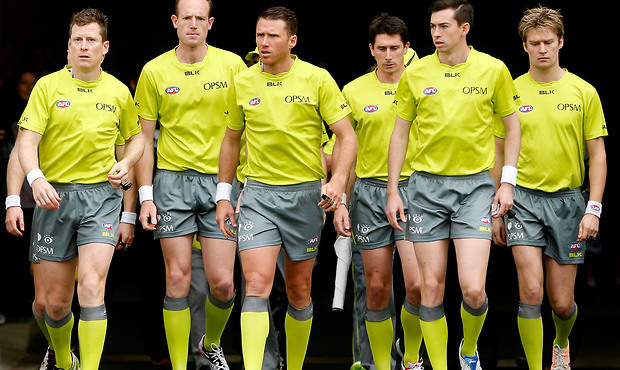 Below are the official rules of Australian football as outlined by Australian Football league. Every Australian football match takes place on a grass oval that must fit into a certain category; 110-155 metres in width and 135-185 metres in length. Each end of the oval has four posts with the inner two being the goal posts. The outer two are behind posts. When a player is running with the ball, he should perform a running bounce at least once in every 15 metres. If a player fails to do so, a free kick is awarded to the opposing team at the point where the player oversteps the mark. When handballing, the ball should not just be handed to the teammate. Instead, it should be punched with the alternate fist. The ball should not be thrown. Australian football does not have an outside rule which means players can move to any part of the oval field at any point of the match. Drop punt: Here, a player drops the ball vertically then kicks it before it hits the ground. Grubber: This kick makes it harder for the opposition team to get control of the ball as it rolls and skid on the ground. Torpedo punt: This kick also makes the ball to spin along the ground making it hard to catch but it can travel further. Banana kick: Also known as check side punt, it is often used for a set shot on goal with a narrow angle. A mark is a distinguishing feature in Australian football. It is where a player catches a cleanly kicked ball after it has travelled for over 15 metres without being touched by anyone else or hitting the ground. Spoiling the marking technique is allowed to stop the player from marking. However, the opposing player can only use a fist or hand in punching motion either prior, after or when the player is catching the ball. A player is not allowed to push the other players from marking. When the opposing team is in possession of the ball, a player carries out a tackle to prevent the team from scoring or gain possession. Due to no offside rule and the contact nature of this sport, a player can be tackled from any direction. The team in possession of the ball employs shepherding method to protect their team. The tacklers should not push from the back when tackling and should also not tackle above the knees or below the shoulders. Spear tackles are also not tolerated. This is when a player throws himself into the opponent using the shoulders. When a player is tackled, he should dispose the ball by handballing or kicking it. If they fail it, they are penalized and a free kick is given to the tackling team. Spoiling mark by restricting the opponent’s arm.